There are so many ways a heart can break. And I don't think it's a coincidence that this epicenter of the body is also where emotions are visualized to be held. It would make sense that our most important muscle performs life support for our physical bodies as well as our souls. And no one can deny that both kinds of heart break cause physical pain. Two of the strongest women I know recently had their hearts broken. My grandmother underwent open heart surgery last week. At 80 years old, she promised me that she'd get through it because she wasn't going to miss my wedding. As proof, she explained how she'd already bought her dress, price tags still intact, and how it would be a true crime to waste it. And one of my best friends suffered the metaphorical kind of heart break, the kind with which everyone is familiar. The world is so full of clichés regarding this particular kind of loss, that none seem to retain their original poetry. And a person can be told over and over again that these kinds of feelings, the ache in the chest, the loss of appetite, can, in the end, be beautiful. Can remind us of how much we need one another, even if our encounters turn out to be fleeting. Thankfully, both women will get through their heart break. And, as they say, ultimately only time provides the antidote. But while waiting for months or years to pass, it happens that there are little pleasure which help to take the sting away. I like to think that any combination of butter, flour and sugar would qualify as one such pleasure. So I made this delicate little shortbread, redolent with the flavors of summer. 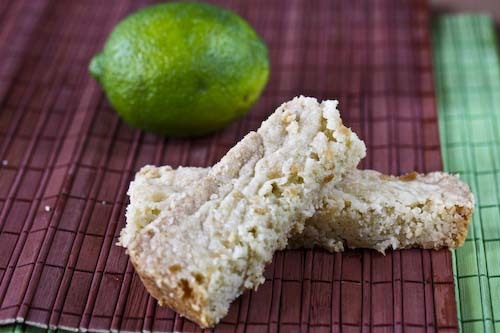 Easy to eat, it melts away on the tongue, leaving lime and coconut behind. While I don't presume to say that sweets melt away all heart ache, they certainly help. Preheat oven to 300F, with rack in the middle. Greese a 9" square baking pan and set aside. Place the nuts and 1/2 cup of the flour in a food processor and grind until the nuts are finely chopped. This should take about 10 seconds constant grinding. Add the rest of the flour, the cornstarch, the sugar, 1/4 cup of the coconut, the zest and the salt. Process for another 30 seconds, until blended, then add the butter cubes, scattering them around the flour mixture. Give the mixture 6 or 7 one-second pulses, then process for a continuous 6 seconds. The mixture should read a powdery consistency. Process once more for about 9 seconds, until the mixture begins to clump together. Turn the dough out into the pan, and press it into the bottom. 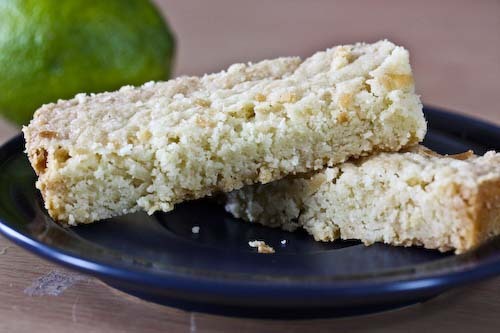 Sprinkle the remaining coconut on top, and lightly press it into the shortbread so that it sticks. Bake for around 50 minutes, until the edges reach a light brown. Cool the bars in the pan, on a cooling rack, for 15 minutes. As they cool, cut them into bars, then remove them from the pan and transfer to the cooling rack until they reach room temperature. I pray your grandmother recovers with flying colors and soon, she sounds wonderful by the way; reminds me of my own dear granny. as for your friend, let her know she's not alone, although it may only help for a short time. What a beautiful post. My thoughts and prayers are with both your friend and grandmother. I'm glad to hear that your grandmother made it through her surgery well. What motivation and moxie she has! I hope your grandmother and friend will both feel better soon.. I hope your grandmother heals quickly and easily. I'll keep her in my thoughts. 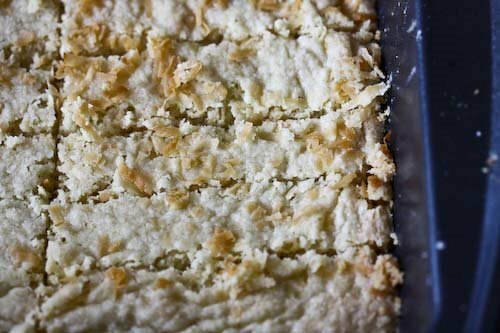 These shortbread bars look great, a perfect welcoming for Spring. Thanks Andrea! Cookies are always a good choice and these look great. The best thing you can do for yourself is realize all this will take time. Once you figure out what went wrong you will be able to examine how to fix it. To help you figure it all out what to do. Click the link for help on how to mend your broken heart. There are a lot of ways to think of just to relieve the pain that we feel after a break-up. We can actually eat sweets or cook delicious foods to forget the pain. But if we want the pain to be gone forever, we can actually have some Thetahealing sessions because a Theta healing therapy relieves the stressed mind and heart making it more focused and renewed. I want to say thank you to Madu Temple for all the good things they have done for me,Though am not sure if this is the best forum to post this but i cant hide my happiness and my Joy so i have to share it with people my marriage got crashed about two years ago and tried all i could within my power but to no avail i saw a post and testimonial about the good things Madu Temple has been doing to help relationships so i decided to give it a trial though they are always busy but when i got a response back to my e mail, they gave me 5 to 6 hours for my marriage to be restored i am happy since then and i am living happily again i am so grateful Madu Temple you can always e mail them here: maduutemple@gmail.com .